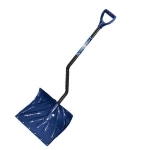 This top of the line combo shovel is ideal for shoveling or pushing snow, thanks to its 18-inch combination blade. The nylon wear strip extends the life of the blade and prevents the gouging of decks and other surfaces. It also features an ergonomic handle and an oversized D-grip that easily accommodates a gloved hand. This aluminum shovel is a must-have! 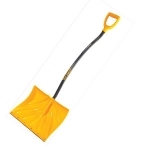 It's a classic snow shovel with a sturdy handle and a wear strip that's great for chipping at packed snow. It features an ergonomic handle that provide 15% more lifting leverage than other ergonomic handles. The aluminum blade is rust-proof and durable and much lighter than a steel blade.